Pune-based Truelytics eComm Pvt Ltd, that runs an online platform for customising personal as well as home-related merchandise under icustommadeit, has raised $250,000 (Rs 1.6 crore) in its second round of angel funding from television serial scriptwriter Virendra Shahney and cardiologist Paresh Doshi. The startup will use these funds to improve its technology offerings, create a better user interface and support international expansion plans over the next six months, it said in a press statement. With the current round of funding, the company has now raised a total of $400,000 (Rs 2.4 crore). icustommadeit.com had earlier raised $150,000 (Rs 915,000) from Salma Chugh, MD of Vertex Group. Commenting on the investment, Shahaney said: "What struck me with regards to icustommadeit.com is the concept. I think it's a fantastic idea. Watch out for another big giant in the making." Shahaney is a well-known writer and creative director. In a career spanning over 15 years, Shahaney has written for several TV shows. His co-investor Joshi is a consultant neurosurgeon with Jaslok Hospital in Mumbai. 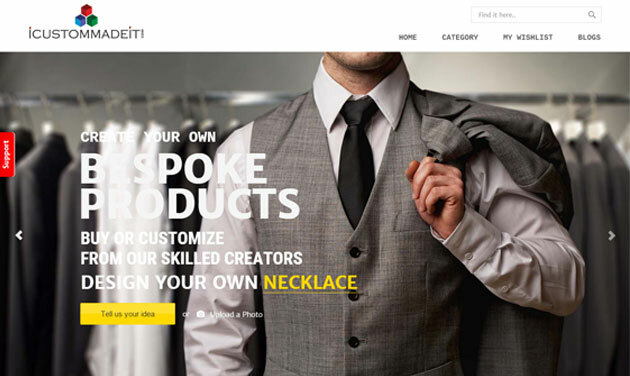 Founded in May 2013 by Raj Iyer and Kundan Dhake, icustommadeit.com is an online marketplace that connects individuals seeking bespoke creations with professional creators. The company launched its services this April. The website features a range of products under various categories including jewellery, furniture, clothing, accessories and home dÃ©cor. It competes with the likes of Zazzle, Printful and other web-based properties for a slice of the online market for customised merchandise. icustommadeit claims to have over 8,000 items on the site across 33 categories and works with 900 creators. icustommadeit.com Truelytics eComm Pvt. Ltd.